Jean-luc Doumont, Trees, maps, and theorems. Principiae, Kraainem, Belgium. 192pp. Hardcover, $96.00, ISBN 978-90-813677-07. If a simple sentence is but a message given shape and cadence by syntax, then what of the larger vessels into which it is poured: reports, presentations, and graphics? What principles guide these larger containers of information so that the messages found within aggregate meaningfully, and are made accessible to the audience? 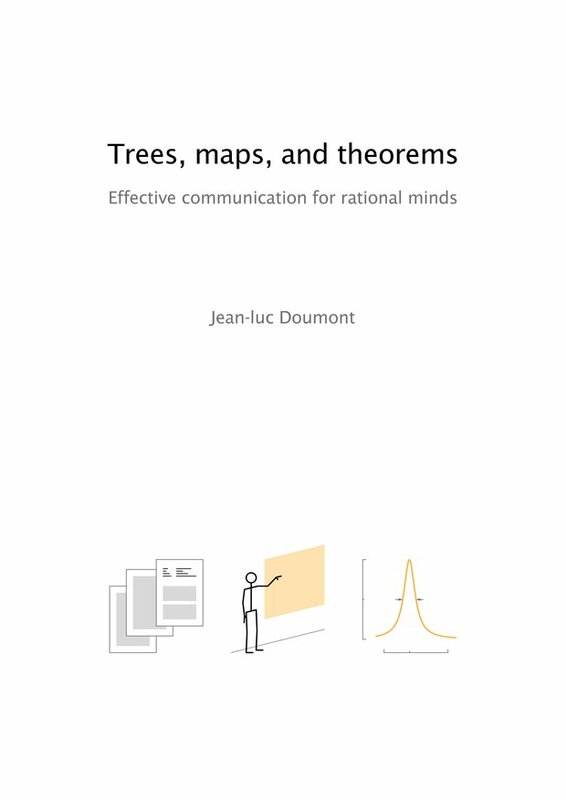 This is the theme of Jean-luc Doumont’s book Trees, maps, and theorems: Effective communication for rational minds. You, as the author, are responsible for creating communications which impart a message effectively to your audience. This is quite different from the common practice where communications merely showcase a maximal amount of information, and that quite often in a fractured way—the expectation being that it is the responsibility of the audience to rise up and somehow penetrate the author’s erudition. Often, communications must compete with noise which impedes the message. You, as the author, must not only anticipate this, but must also work to ensure that the message in your communications is resilient enough to get through. Use redundancy to ensure that the message does get through. That is, that even if the message is made strong, by using redundancy you increase the chances that it will reach your audience. The emphasis on adapting the communications’ form to the recipient is particularly useful, and takes any exposition of design from the abstract and inanimate into the realm of a proper use-case. Here one can test a design by gauging how effectively the message reaches the audience. To take a small example, think of the distinction between a morality play and judicial judgement comprising its opinions and dissents. Both may concern themselves with ethics, but the audience for each is quite distinct. Knowing the audience ensures that the message comes across even in harsh environments. Beginning with these fundamentals, the book then progresses with chapters covering the three forms of communications it concerns itself with: written documents, oral presentations, and graphical displays. For each of the forms, the discussion is then broken into sections covering the different phases: planning, designing, and constructing. One may dive into a chapter covering a specific form without losing much by skipping over the discussions about other forms, but within that chapter it is advisable to work through the material linearly. A navigational map, re-introduced with each chapter and updated at each section, makes it easy to understand where one is within the discussion. With this consistency comes familiarity as one makes one’s way through the book. New concepts, as they are introduced, may readily be plugged into a mental map prepared to receive them. 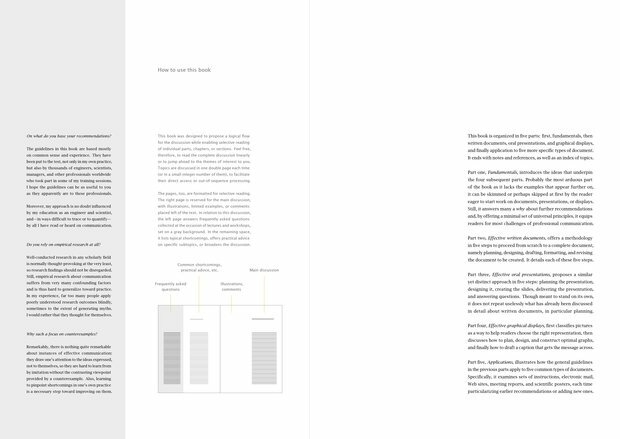 The final chapter animates the guidelines set forth earlier through illustrative examples. Each example comes replete with common errors that are excised as the sample communication undergoes a transformative process and is made better. So is the book an exemplar of the very principles it espouses? The simple answer is yes. Its emphasis on message over raw information permeates the text. Illustrations are used to give context to the discussion and are used as needed without distraction. 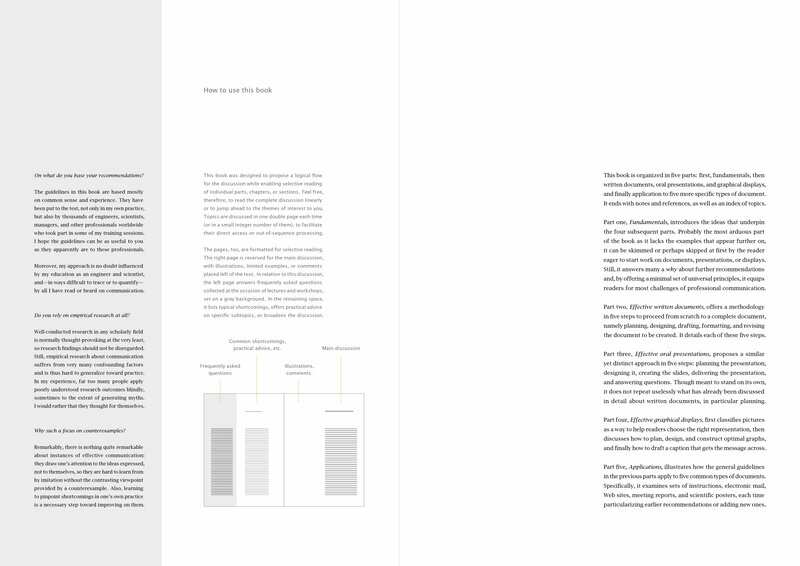 Within the page design, a grid is used to align elements: textual, tabular, and graphical. The spacing in and around elements makes it easy to navigate, to move back and forth between different levels of abstraction, as well as to return to exceptions without interrupting the flow of the main message. An attentive reader will notice a compulsive adherence to paragraph layout as the last sentence of each paragraph ends up perfectly aligned at the right margin. While this is admirable, it does produce a disconcerting effect in that one can never be sure if, at the bottom of the page, the paragraph is complete. As typesetters, both amateur and professional, we pride ourselves in our precision. Sloppy typesetting is considered to be a contraindicator of precise thinking. What Doumont does is to raise our sights higher. While precision is essential in the layout of information, it is a weak standard when it comes to assessing the effectiveness of the underlying message. Giving shape to the message so that it reaches its audience is that real purpose of all communications. What Doumont illuminates so effectively is that, by taking communications from the mere aesthetic into the realm of signals, we can distill best practises to ensure these signals reach their destination intact and with greater frequency. If there is an omission in this book, it might be this: I was taught long ago in some sales training that the most effective form of communications is a story. Stories are universal, and often resonate well even across cultures. As such, messages can be made more effective if woven into a narrative. I hope that Doumont will consider this as a request for a follow-up edition which includes this aspect of enhancing signal strength, or as a book on its own that might use this as a theme. So let me end with a story of my own. I have on my bookshelf a book given to me some decades back during one of my last visits with my grandfather. The book is Write Better, Speak Better which was published in 1973 by Reader’s Digest. In my arrogance, a not uncommon crutch to the awkwardness of youth, I accepted it glibly and promptly put it aside. By then I had discovered that my affinity was for things technical, and language seemed like a murky inkwell. It was only much later that I came to the realization that it is with the power of language that we can express our ideas—technical and otherwise—most effectively. And because of the satisfaction derived when doing so, I have been playing catch up ever since. Doumont’s book is a most worthy addition for anyone interested in expressing themselves to a wider audience, and I recommend it heartily. Editor’s note: We are happy to note that TeX Users Group members in good standing enjoy an exclusive discount on this book. The details can be found at https://www.tug.org/members.